Individuals with color-grapheme synesthesia experience color when viewing written letters or numerals. Although some studies examining whether there is a learning component to synesthesia have returned negative results, these studies have examined very small numbers of individuals. Witthoft and Winawer revisit this question with the benefit of a larger sample. 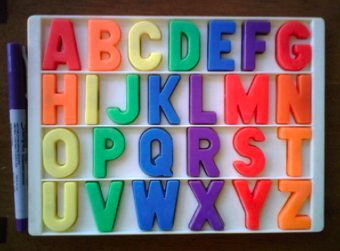 Eleven individuals with color-grapheme synesthesia completed a color-letter matching task in which they indicated the shade of the color they associated with each letter of the alphabet. The researchers found that participants’ color-letter associations closely matched those found in Fisher Price magnetic letters sets — which all but one of the participants had owned as a child. The authors suggest that these findings demonstrate a need to include learning and memory components into explanations of synesthesia. The full article (available only to subscribers) is very clear that these results don’t mean that some number of synesthetes have simply learned the letter-color associations from refrigerator magnets. For one thing, a huge number of children have been exposed to the Fisher Price alphabet, but the number of synesthetes is small. Witthoft and Winawer suggest that a small number of children are inclined to synesthesia, and that for them, exposure to colored letters and numbers can provide models for their associations. This entry was posted on January 29, 2013 at 11:31 am and is filed under Psychology of language. You can follow any responses to this entry through the RSS 2.0 feed. You can leave a response, or trackback from your own site. In case you might have been thinking that the Fisher Price people chose the colors for the letters because of some appreciation of color-grapheme associations, you should notice that there’s a simple principle governing the assignment of colors to the magnetic letters: run through the alphabet in order using the six basic colors, in order: RED, ORANGE, YELLOW, GREEN, BLUE, PURPLE.